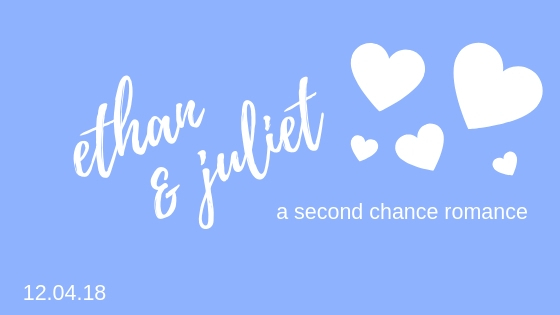 If you follow me on Instagram you’ll have heard me talking about Ethan & Juliet since August at least. And if you’re one of the real lucky ones who read all the way to the end of The Other Lane, then you’ve already seen it. BUT, for anyone who hasn’t, this is an early teaser of what’s to come December 4th! Juliet slapped her palm against the steering wheel as traffic closed in around her. She should have known better than to get on the highway at eight o’clock in the morning even if it was the fastest way to get from Overland Park to Midtown. And she needed to be in Midtown ten minutes ago. Fifteen minutes ago, Juliet had stepped out the front door of the birth center into the brittle warmth of the spring morning with no other plans than to go home and nap. She’d squinted past the newly leafed trees and into the sunlight. Juliet had basked in the afterglow of assisting in the uneventful birth of a healthy baby girl. The high of witnessing new life never got old, but the adrenaline of it had already worn off. Exhaustion had pressed down on her shoulders like she’d been carrying both her physiology book and her pharmaceuticals book in her bag at the same time again. She’d wanted to go home and sleep and sleep and sleep. Juliet had taken one deep, cleansing breath in through her nose and out through her mouth and had just turned toward her heap of a twenty-year-old Toyota when her phone had buzzed in her pocket. The screen had flashed Gina’s name, and Juliet’s heart had ticked up a notch when she’d heard panting over the line instead of words. “Gina? Gina are you OK?” she’d asked. A whimper had been her answer. Juliet had done a mental sun salutation since she hadn’t had time for a real one, then she’d pivoted on her heel and walked right back into the birthing center. On her way, she’d asked if Gina was experiencing pain between contractions and if she’d noticed any spotting. A yes to both. “And Colin is still . . . out of town . . . and it’s too early.” Gina’s voice had been a sharp whine interrupted by hard pants. Gina had groaned as another contraction came on. Juliet had snagged Charlie, the midwife she’d worked with the night before and filled her in. “She needs to get to the hospital,” Charlie said. Charlie had offered to take care of the official transfer and meet them there. Then Juliet had been off, only to wind up stuck in traffic ten minutes into a twenty-minute drive. The wait was long enough for every awful thing that could be wrong with Gina to pass through Juliet’s mind. When she felt panic crushing her diaphragm, she focused instead on how good it had felt for Gina to adopt her when she’d first moved to Kansas City. How all the nights drinking wine and dancing had forged a sisterly relationship that withstood Juliet’s split from Gina’s brother. Juliet’s pulse slowed as she remembered and breathed. They were both strong women. Gina would survive this. Juliet would get her to the hospital. The University of Kansas Medical Center was the best hospital in the area, with the best doctors. Gina would be fine, and Juliet could do this. She was a nurse, almost a full-fledged midwife, she was trained to stay calm in these situations, so she would, even when it was one of her best friends in danger. Juliet practiced breathing in through her nose, out through her mouth, and it did almost as much as a good round of yoga. Then she remembered she’d offered to call Rich and cursed. Juliet fumbled her phone out of her satchel, and scrolled through her contacts, keeping one eye on the road in case the car in front of her moved. “Durand.” He answered, with a perfect French accent. “Are you going by your last name now?” Juliet asked. From the scraping and scuffling noises in the background, Juliet guessed Rich was gathering papers off his desk. “I’ll be there in fifteen minutes.” Then he hung up. It might have been the least amount of flirting Rich had ever pulled off in one conversation. At least he understood the situation. Rich had always respected her professionally, even if he hadn’t been good for her in any other way. When Juliet arrived, Rich was making Noah eggs, but paused to help Juliet get Gina into the car. Juliet’s hope that Rich had somehow been horribly scarred in the last two years were dashed the second she laid eyes on him. His thick, wavy dark hair fell in his earnest brown eyes. His olive skin glowed in the morning sun as he gripped Juliet’s hand and thanked her for being there for his sister. Looking up at him, Juliet was reminded of the first time they’d met. He was just as gorgeous at thirty as he’d been at eighteen. Possibly more so. Juliet snatched her hand back and only just resisted wiping it clean on her scrubs. “I’ll call with news as soon as I can.” Then she joined a groaning Gina in the car. The drive to KU Med took less than ten minutes, and Charlie met them at the emergency room doors along with a nurse who got them checked in and into an ultrasound. Then they were admitted to the high-risk wing of the Labor and Delivery ward. Juliet helped Gina through contractions while Charlie coordinated with the hospital staff. After what Juliet considered far too long, the door opened and a man in a white coat entered the room. Juliet’s heart might have stopped beating when he snapped the file he’d been reading shut, revealing his rugged face and bright blue eyes. Juliet knew she would run into him eventually. To have made it four years without meeting him when they worked in the same field was almost a miracle. What wasn’t surprising was the near scowl he wore as he took them all in one at a time. He’d always hated midwives, and here were two, along with a patient in distress. That would make him cranky. And if his greasy hair and thick stubble were any indication, it was well past the end of his shift. Oh yeah, he would be in a great mood. Gina squeezed Juliet’s hand, and Juliet tried to give her friend a reassuring smile, but that was when the doctor spoke. Juliet and Charlie had explained to Gina that they thought she had a partial placental abruption, but the hospital staff hadn’t said a word. When asked, the nurse had said they were waiting for the doctor to get out of surgery to confirm the results. The doctor they had been waiting on was now exchanging glares with Juliet’s boss. “It’s the only way to deliver safely at this point,” he said, angling his head back toward Gina. “Is the baby okay?” Gina asked, her voice quavering in panic. Gina let out a little sob of shock and her heart rate monitor beeped a little faster. She was pretty sure she heard Dr. Harvey’s teeth grind. Dr. Harvey explained the surgery and recovery as if his life depended on him doing so in fifty words or less. Then he swept himself from the room with a dark look in Juliet’s direction. She didn’t flinch. It wasn’t her fault his bedside manner was so atrocious that she’d had to translate for him. “That’s it?” Gina panted through a contraction. Juliet nodded and squeezed Gina’s hand back, and said, “He’s the best,” trying not to let anything else show on her face. In her mind, Juliet was poking Gina in the shoulder, saying “Oh my God, oh my God,” over and over, and maybe throwing a “He’s the one!” in there. Juliet hadn’t seen him since she’d finished nursing school. Her life was completely different now, but Ethan hadn’t changed at all. He was still broad and sturdy like a rugby player, only three or four inches taller than she was. His shaggy, dark hair still escaped from beneath the surgical cap that matched his blue eyes. He still couldn’t take the time to talk to his patients and was apparently working so much he couldn’t even be bothered to shave. The Dr. Harvey she remembered had always been miraculously clean shaven, even at the end of a twenty-four-hour shift. He looked more ruffled this morning than he used to get, but Juliet had to admit she liked the beard. It matched him somehow. A nurse with a consent form arrived then, and Juliet focused again on Gina, and not on the way Dr. Harvey’s eyes had looked at her in annoyance. Not that she wanted him to look at her at all, she wanted him to focus on Gina. Juliet did not want to talk to him, or about him. She’d avoided all reference to him for four years. All she had to do was to make it through this surgery, and she could go back to forgetting he existed. Only once the surgery started, Juliet had trouble not watching him. She was positioned by Gina’s head, so she couldn’t see his hands, but the poise of his shoulders, the stillness of his body as he worked, the soft whisper of his voice, efficient with his words as he directed the staff. Juliet noticed every breath he took. He was impressive, and despite herself, Juliet felt a pull in her belly to be near him as he worked. She wasn’t the only one. When she’d been in nursing school, Dr. Harvey had been the young, handsome doctor who notoriously never dated nurses. Which meant each of Juliet’s classmates had wanted to be the exception to the rule and flirted shamelessly whenever he was near. Despite her attraction, Juliet hadn’t bothered. She’d had Rich back then, and they’d been talking about getting married. While she’d noticed Dr. Harvey’s sparkling blue eyes and unshakable confidence, she’d also noticed they came with an air of entitlement and a healthy dose of arrogance. He didn’t just not date the nurses, he spoke to them over breakfast with half-teasing condescension, and sometimes even a hint of derision. Even among his fellow obstetricians Ethan incited controversy and lead discussions with a tone that implied anyone who disagreed with him was an idiot. Rich’s soft charm and poise had been magnetic by comparison. Rich’s passion had been so intoxicating that even when Juliet had met him at fourteen, she hadn’t been able to imagine loving another man. Most days she still couldn’t, but she was no longer as naive as she had been four years ago when she thought she and Rich would get married, have babies, and live happily ever after. In that moment of regret, Dr. Harvey raised his eyes to hers and held. It lasted only a moment before his eyes were back on his work. She wondered how he remembered that night, and if he despised her for being there with a birthing center patient. “Birth,” she remembered him saying about at a group breakfast one morning, “could go from normal to dangerous in a split second. Why would anyone endanger themselves and their child by choosing not to have every modern option available?” It had maybe been those words, more than anything else that had kept Juliet from seeking him out again, not when she’d been angling for the job at the birthing center near the end of her nursing degree, and not after she’d started her midwifery program two years ago. A cry broke through the quiet stillness of the operating room, and Juliet left her memories to share a tearful smile with Gina as Dr. Harvey said, “It’s a boy.” He handed the baby off to a nurse and returned his attention to Gina. Juliet stayed with Gina until the surgery was over since Gina’s husband had arrived just in time to accompany his new son to the nursery. When they wheeled Gina to recovery, Juliet escaped back to the room and collapsed into the nearest plastic chair. She let relief wash over her. Abruption could be so, so bad, but they’d gotten here in time. Every muscle protested in exhaustion as she checked her watch. It was after eleven. She’d only slept four hours in the last two days. Juliet couldn’t remember the last time she’d eaten, and she’d have to be here another couple of hours at least. The door opened, and Juliet sat up, expecting to see a nurse wheeling Gina in. Instead, Dr. Harvey leaned against the door frame. “How about breakfast? Dino’s?” It was the diner across the street, the usual gathering place. Juliet nodded, knowing her confusion showed on her face, but he smiled like maybe he didn’t despise her after all. I hope you’re ready to read chapter two! I don’t have pre-orders ready just yet, but check back here next week for the cover reveal, and I will definitely have links for you then! What else are you reading right now? I just finished Kingdom of Ash, and boy howdy was that an intense book. I picked up RS Grey’s Anything You Can Do as a palette cleanser. I love her books.